The LISOMs Art Gallery will be opening soon! For several years we've been trying to figure out a way to give back to the MS community. And now we've found a way. 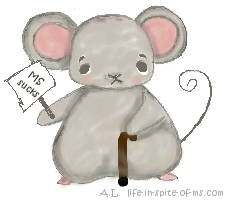 In honor of National MS Awareness Month 2013 we are forming an art gallery. Life in Spite of MS or LISOMs will open an art gallery on Etsy to feature MS art and artists who wish to donate their artwork for sale to help end MS.
What type of artwork can I submit? I'll answer that question with a question - Have you ever heard of an ACEO or an ATC? Yes, then you are ready to submit! If not, I'll tell you. ACEO or Art Cards, Editions and Originals and ATC or Artist Trading Card are little collectible pieces of art. They are a unique way of getting a sample of your artwork in the hands of your buyers. The only rule is that they must be 2.5x3.5 inches in size. Other than that, it's left up to you! What are they made out of? Whatever medium the artist traditionally uses. Do you paint in oils, acrylics, or watercolors? Do you use colored pencils, pen and ink, or pastels? Do you work on paper, or canvas, or do you work with wood, clay, fabric, or metal? Whatever medium you work in is fine. If that is what your artwork is made of, we want to see it, in miniature of course. Should I submit an original or a print? Do you have a series of paintings about MS that you would like to share with the world? Or is your piece an original, one-of-a-kind (OOAK)? Is it a print or part of a limited edition? Any way is fine. There's no right or wrong way to submit your ACEO. Can I submit someone else's artwork? At this time, no. You must submit your own art - art that you have the copyright to. You don't need to go out and copyright your work unless you want to. Your signature and date on the back of the piece is enough. Does it have to be a painting about MS? Yes, and no. Is it MS related or are you, the artist, an MSer? Did you make it to remember someone who has MS? Your mother, father, or friend? Then this is a wonderful way to remember them by. Also, when you submit your artwork, be sure to tell your family and friends so they can help support your contribution to help raise money to end MS.
How do I submit my art to the LISOMs Art Gallery? Glad you asked. Use the form below to enter your artwork. Enter the "Name" of your piece, the "Medium" you used, and a detailed description. This will be used to create the listing in the Etsy shop, so make it as detailed as you like and include a little about yourself, as well. What should I include in my description? Why you are submitting your artwork to the LISOMs Gallery, how long you've been creating art. Where can buyers find more of your work? Enter whatever you like. We'll use this information to create your listing. How much will be donated? 50% of the selling price will be donated. We will keep a running total of the amount to be donated to the NMSS as we go along. So bookmark this page to stay updated on our progress. So get those ACEO's submitted for the Grand Opening! Can I submit a different size piece? At this time we will only be accepting ACEO's. But stay tuned. This may be changed at any time. Bookmark this page to stay updated. Where do I send my ACEO? We will send you an email with a link to the page to find additional info as well as the mailing address after you have submitted the form below (adding soon). Can I submit more than one ACEO? Yes, you may submit as many as you like. We will be featuring an artist every month here on the site with a link to your website, shop, or blog. Each submission gets you one entry into the Featured Artist of the Month. More questions about the LISOMs Art Gallery? Well, contact us here and we will do our best to answer them. We will be adding the form soon, so please - you guessed it - bookmark this page so that you can find it easily. Want to find MS graphics? Go here from the LISOMs Art Gallery.